Abu Dhabi (Special to The Seoul Times) — A decision on allowing branches of other GCC and foreign banks in UAE will soon be taken, according to Sultan bin Nasser Al Suwaidi, governor of the UAE Central Bank. 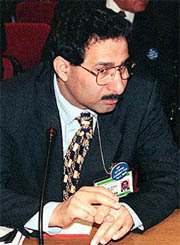 He also touched upon other issues of banking while talking to the press on the sidelines of the first International Financial Reporting Standards conference on June 7, 2004. Referring to the issue of compliance with International Accounting Standards (IAS), Al Suwaidi said it would be better if all non-banking companies listed on the UAE's stock exchanges also comply with these standards, just as banks do. This, according to him, will improve the image of UAE-based companies among international investors, including foreign institutional investors (FIIs). He said this will certainly attract more investments into the country as portfolio investments as well as foreign direct investments (FDIs). Question: Will the UAE Central Bank open up the banking sector to new foreign players? Answer: Sultan bin Nasser Al Suwaidi: We are going to do this in a three-pronged way. 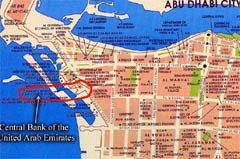 We will soon take a decision on allowing branches for the banks from the other GCC countries. Along with the same move, we are trying to deal with the issue of allowing more branches for the foreign banks which are already existent in the country. There are other foreign banks which are keen to make entry into the UAE and a decision on these three issues may be taken at the same time. The Central Bank board has been discussing this for some time now and a decision on the same is expected sooner rather than later. What about the move to apply a uniform level of corporate tax on foreign and local banks? We are moving towards a regime where both foreign as well as local banks will be paying the same level of taxes. The board has to take a decision on this. Question: Will tax be reduced or removed for foreign banks to achieve this? Answer: The decision whether to remove tax or reduce tax for foreign banks will depend on the board. Question: Does this mean that the national banks will start paying tax? Answer: It is again the board which has to take a decision whether to introduce tax for local banks in order to make the taxing uniform for banks. Question: Do you have plans to increase the minimum capital for banks? Answer: When the new banking law becomes ready, the minimum capital will also go up. As of now, the minimum capital required for the banks in UAE is Dh40 million and this will be raised in the new banking law. Mr. Min Byung-Il serves as editorial director and senior writer for The Seoul Times. He was former managing editor and executive director of the Korea Herald. Min has also been serving as resident correspondent for Emirates News Agency (WAM) of the United Arab Emirates since 2001.